Episode #51 Timecapsule: The Northrend zone of Grizzly Hills is rich in beauty and design. Two hidden, interesting scenes can be found deep in this rustic forest. The first curious thing explorers can discover is the Azeroth version of the popular story of “Bambi”. Near the Alliance Brigade Encampment, a group of forest friends patrols a small clearing – including a young fawn named Bambina. Visitors to this area of the Grizzly Hills will get the opportunity to witness Bambina avenge the death of its mother. In addition, a second lesser known NPC is Hugh Glass. This human hunter was placed in game by Blizzard designers to represents the real-life, 19th century pioneer of the same name. 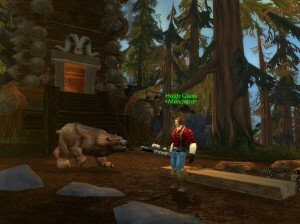 Found here with his pet grizzly bear, Griselda, he is the only vendor in all of Azeroth that sells the unique item, Silvercoat Stag Meat. Amazing artwork design for the Warcraft Less Traveled website by the generous talents of Nevik James! This entry was posted	on Tuesday, June 28th, 2011 at 12:47 am	and is filed under Podcast Episodes. You can follow any responses to this entry through the RSS 2.0 feed. You can skip to the end and leave a response. Pinging is currently not allowed. Another Gem of a podcast! Definitely diggin’ the new graphic! Off to visit Grizzly Hills for some relaxation with furry animals. Nice! A calm, leisurely picnic with some forest friends sounds like a perfect way to spend the weekend.